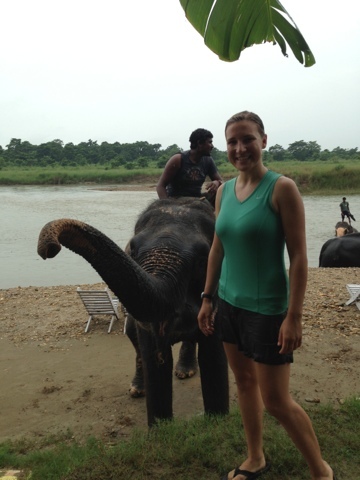 Eat, Run, Read: Chitwan National Park: Elephant Baths! Wild Rhinos! Crocodiles! 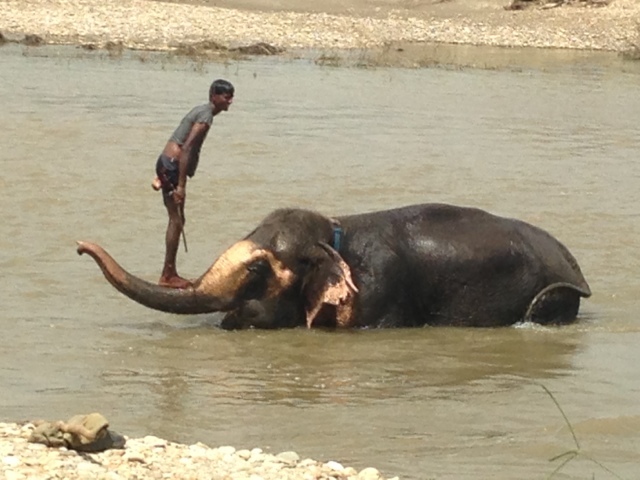 Chitwan National Park: Elephant Baths! Wild Rhinos! Crocodiles! I'm hesitant to indiscriminately throw around the phrase Best day ever! but well, ELEPHANT BATH! Aka we did so many awesome things today and I'm super-psyched to tell you all about it! We're in Chitwan National Park, which is about a 6-hour bus ride from Kathmandu and (after trekking) one of the main things tourists do in Nepal. Per usual we had nothing pre-booked, and only a vague sense of how things work. We got off the bus yesterday and a guide approached us "Come with me! This taxi will take you to the center of the town and you can pick out your hotel there yourself! Yes! Yes please, good!" Ummm yes that is exactly what we want. So we found a nice, clean, well-lit room (three of our main criteria) at Hotel Orchid (if you go to Chitwan, I recommend it). Apparently during tourist season all the hotels here are FULL, but as it has been for our entire Nepal experience, we're pretty much the only ones here. That same guide became our fixer for the trip. And I will take this moment to strongly recommend him -- Binda of Binda's Animal Adventure, whose office is across from Sweet Memories Restaurant (get the organic coffee - french press! - and a banana honey pancake. You're welcome). Binda's office is under construction now and Sister2 and I just came up with that name for it upon request. 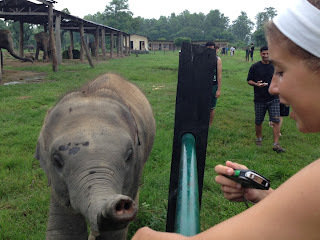 So if you DO go to Chitwan and see it, please report back? I would be SUPER excited! Anywho, we started this morning with a canoe ride down a river in the park. Of course there's no guarantees when seeing wildlife (recall our Bardiya experience), but even though it was raining we saw four crocodiles along our 30-minute way! The canoe ride ended at the Elephant Breeding Center. I should pause right now to tell you that elephants are, and always have been, my favorite animals. They're big and kinda dinosaur-ish, but also super-smart and graceful. They have families and a matriarchal society and they mourn their dead. And have you seen their trunks up close? So cool! So we watched baby elephants for a while. The mothers are used for elephant safaris and owned by the government, the fathers are wild jungle elephants, and any male babies born are given to the Nepalese army for patrolling. 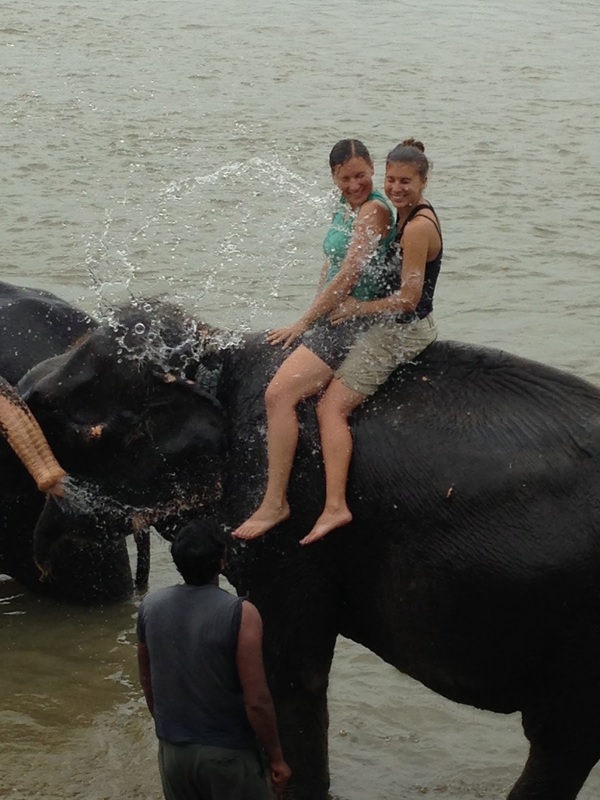 AND THEN WE TOOK A BATH WITH AN ELEPHANT. It's something they do every day at another part of the river. 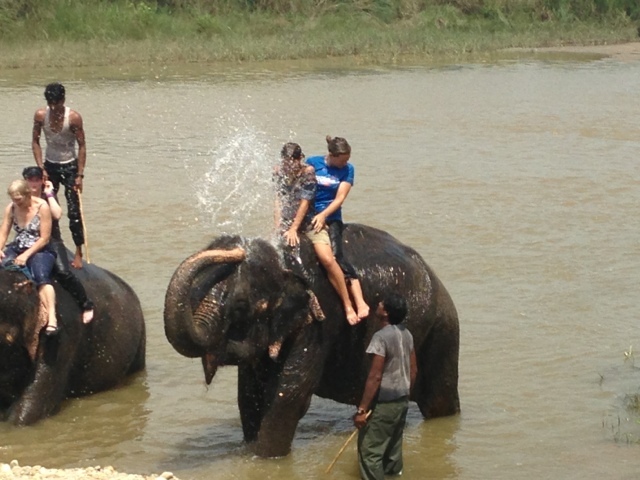 Trainers wash their elephants, and let tourists watch and/or join in for tips. So much fun!!! Our elephant kept sitting down, i.e. throwing us into the river, like the largest bronco ride ever. First we saw the rhino across an open field and were pretty excited about that. 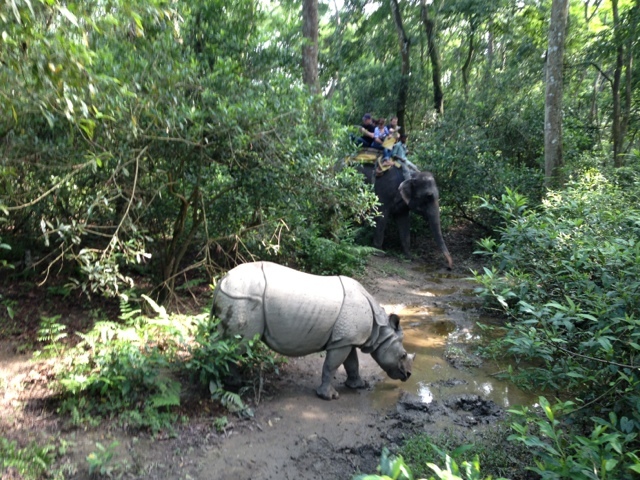 Then the elephant driver kicked us into gear and we followed the rhino into the jungle. 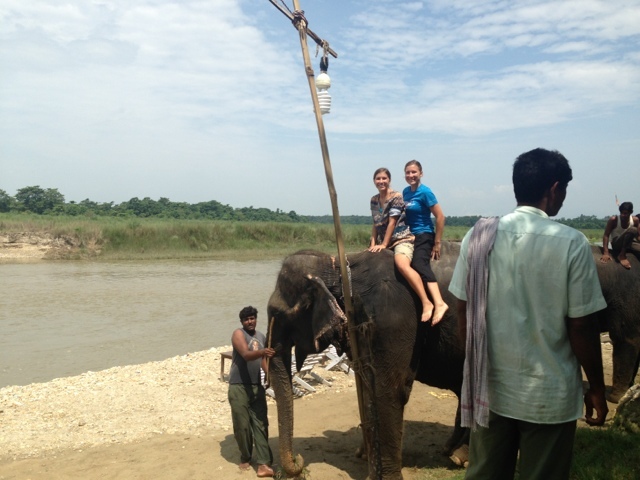 We got up parallel to it, then two other elephants (with drivers and tourists) helped us surround it. We had our doubts about the safety of this situation, as cornering an very large animal with one giant horn does not strike me as particularly advisable, but I guess an elephant trumps everything, so we were safe on it's back? Today was much less activity-filled than yesterday, and involved a lovely quantity of reading and eating and card-playing and countryside walking. But we did the most important thing -- i.e took ANOTHER elephant bath. Because we could and therefore we should. 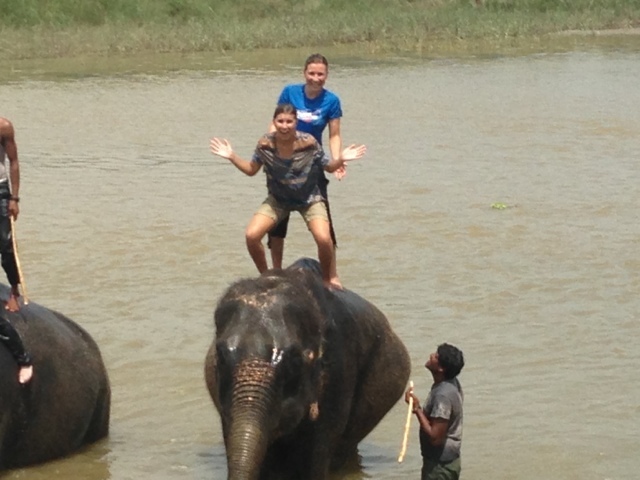 This time Mohammad, our elephant's driver, had us stand up on our elephant's back! Second time was just as awesome as the first well duh. I could do this every day.